HIGH DRAMA Things are not exactly looking up for the characters in von Trier’s saga of young love, family foibles and global cataclysm. Leave it to Lars von Trier to begin his latest with movie history’s most transcendently gorgeous spoiler. It’s a sequence that, except for its final seconds, could be an outtake from Kubrick’s 2001: A Space Odyssey. From a vantage point in space, we watch as a giant celestial body sails slowly toward the Earth. We listen to ominous strains from Wagner’s Tristan und Isolde. We realize we’re about as far from Hollywood as filmmaking gets when our planet is obliterated in a cosmic hit-and-run. So much for suspense, you might assume. Well, not quite. 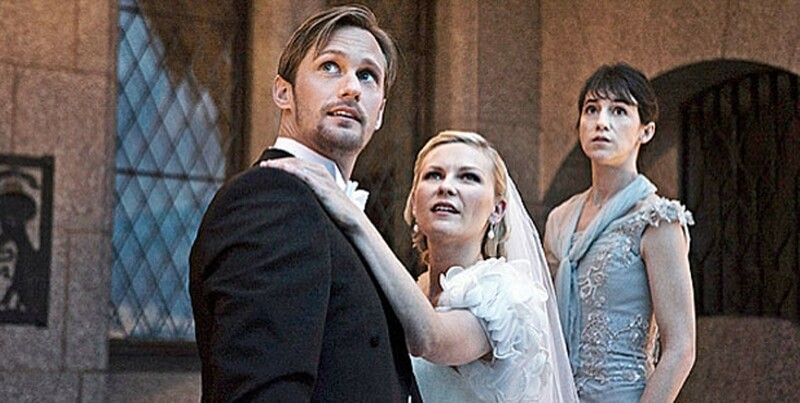 As the Danish writer-director has explained: “You can know what happens and still not know how it happens.” Melancholia is less concerned with the end of the world than with how it feels to confront that prospect, and it explores its theme on a radically intimate scale. Where the typical tale of global cataclysm drags in screaming mobs, dismissive bureaucrats bickering with scientists, real-life news media types doing cameos as themselves and, of course, lots of clock-racing heroes, von Trier focuses almost exclusively on the members of one extended family. And what a family it is. His picture is divided into two parts, each named after one of the daughters. The first, entitled “Justine,” depicts the daylong wedding of a clinically depressed young woman played, in the performance of her career, by Kirsten Dunst. The setting is a luxurious country resort owned by Justine’s arrogant brother-in-law, John (Kiefer Sutherland). Her sister, Claire (Charlotte Gainsbourg), has overseen arrangements for the festivities and grows increasingly impatient as Justine grows increasingly less festive, hour by hour succumbing incrementally to the undertow of her condition. The viewer doesn’t have to look far for likely sources of her instability. Justine’s mother (Charlotte Rampling) is a warped and venomous creature. John Hurt, I have concluded, has for some time played only two types of characters — a dissolute ruffian or a dissolute man of means. He’s at his blackly comic best as Justine’s father, an addled gentleman who inexplicably addresses all women — his daughter included — as “Betty.” The first act is richly odd and obliquely funny. If you attend only one movie wedding this year, I urge you to make it Justine’s. A little research reveals that von Trier, whose personal struggle with depression is well known, means to advance a more intriguing possibility: that, in a time of unimaginable catastrophe, the depressive personality might feel more at home and thus prove more functional than someone accustomed to believing the universe is benignly ordered. If every day feels like the end of the world, the end of the world is just another day. Melancholia is a stunning achievement artistically, intellectually and in terms of filmmaking craftsmanship. Its closing moments rank with the most unsettling and lovely ever put on film. As you lock eyes with three human beings bracing for the big finish, the climax may not come as a surprise. It’s a testament to von Trier’s genius that this doesn’t stop it from coming as a shock. * Running time: 135 min.